This morning in the Augusta Chronicle columnist Scott Michaux wrote: “Time to reactivate Arnie’s Army”. It was part rallying cry and part a reflection of the palpable sense of devotion and gratitude that Augusta National and Masters patrons feel towards their favourite champion, Arnold Palmer. Of course they were there around the first tee, in their hundreds at 7:45am, crammed in trying to catch glimpses of golf’s ‘Big Three’; Palmer, Jack Nicklaus and Gary Player. This morning was the 10th time Palmer has served as honorary starter of the Masters – with Nicklaus joining him in 2010 and Player since 2012 – but old age and failing balance prevented 86-year-old Palmer from striking a ball this year. 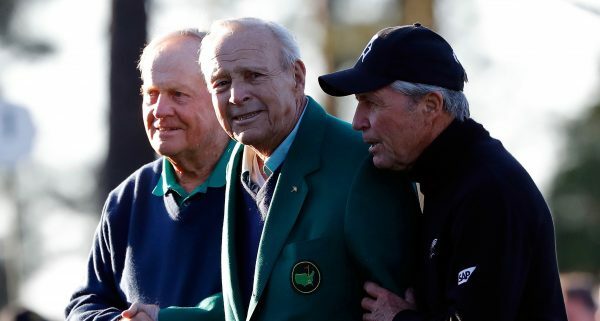 With 13 Masters victories between them (Palmer was the first to win four and Player followed up with three before Nicklaus completed his half dozen in 1986), the Big Three were introduced with a heartfelt welcome by Augusta National chairman Billy Payne, who had walked out hand-in-hand with Palmer’s wife Kit while Palmer soaked up the warm applause from a chauffeur-driven buggy. Palmer smiled and waved, emotions were high and Nicklaus wiped away a tear before being out-driven by Player – in what has also become an annual custom here – and that was it, the 2016 Masters was ready to begin. “We have had a very unusual friendship amongst competitors,” said Player afterwards. “It was so fiercely competitive, and we made it very clear we wanted to beat the hell out of each other, and when we did we looked the other man in the eye and said, ‘Well done’. So we built a unique friendship. “To have longevity has been a special gift, and to come here today and to be on the tee with Arnold, it was gratifying and sad, because everything shall pass. Said Nicklaus: “Everybody was happy to see Arnold out on the tee and I think Arnold was delighted to be out there. We were delighted to have him there. It covers only a few square miles, the population has never been greater than 12,000 and it’s not exactly on the main drag­; off the highway an hour or so east of Pittsburgh.